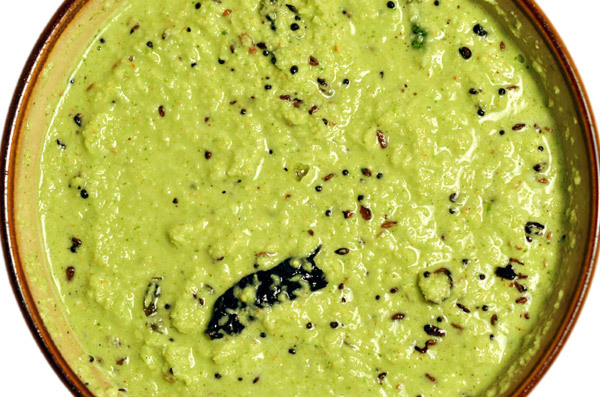 You are viewing the archive for the ‘Coconut cilantro chutney recipe’ tag. Pongal was my morning ritual every day before I went to my college on a small town located in southern India. A while back someone asked me what my favorite south Indian dish was. I paused and answered “Pongal”. Technically, I like Ven Pongal or spicy pongal not the Sakarai Pongal or sweet pongal. 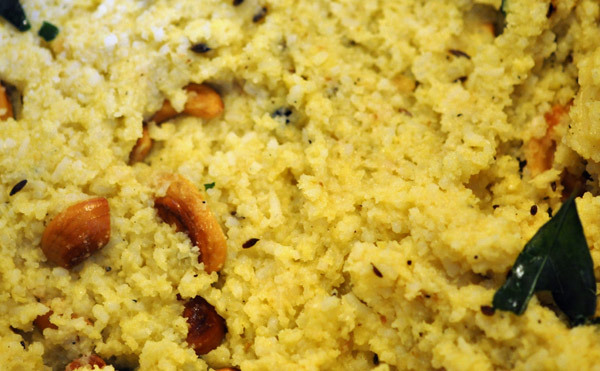 Pongal is made of rice and mung bean cooked into porridge like consistency. 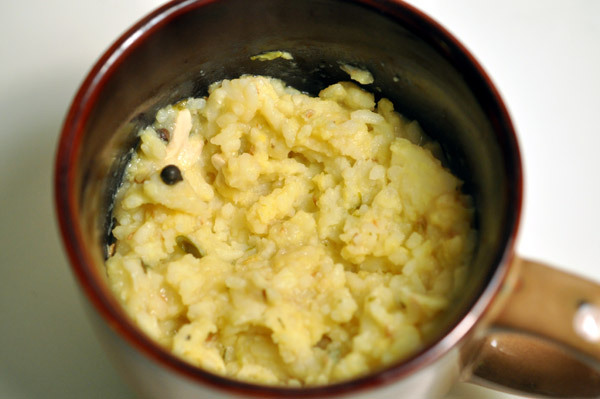 Ven pongal is eaten with either sambar or chutney as a common breakfast food. I am not a big fan of breakfast food but Pongal tops this very narrow list of my favorite breakfasts. Pongal is usually a main dish consumed in Pongal festival celebrated by Tamils in state of Tamilnadu in India and Sir Lanka. Pongal festival marks the end of cold winter and dawn of spring harvest. Interestingly it falls close to festival of Makara Sankranthi celebrated in my home country of Nepal and throughout India. Pongal festival is dedicated to the Sun because the sun is considered as a deity for the good harvest and baptizing the first grain to the sun is appropriate. Pongal is celebrated for four days in the mid-January with celebrations of drawing Kolam, swinging and cooking of delicious Pongal. Sweet pongal (Sakarai Pongal) with generous amount of sugar, jaggery (gudh), coconut, on earthen pots are served in temples as a Prasad, a Hindu communion or offering to god. On one Saturday, after wondering what to eat for brunch, we finally settled on making pongal with coconut chutney. 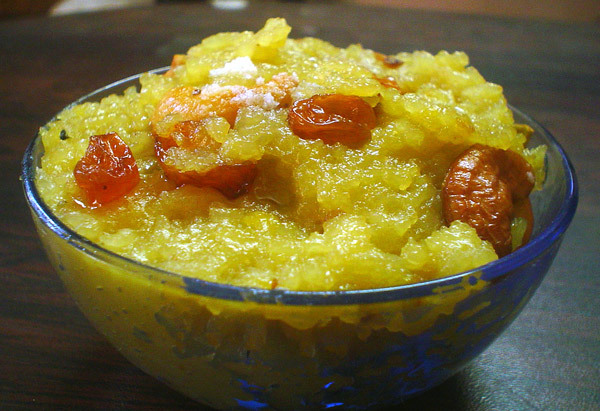 I have never made pongal in my life so I was excited, confused, and at the same time nostalgic about my college days. We started by getting groceries at an Indian grocery store, Krishna Grocery in Springfield, Virginia. 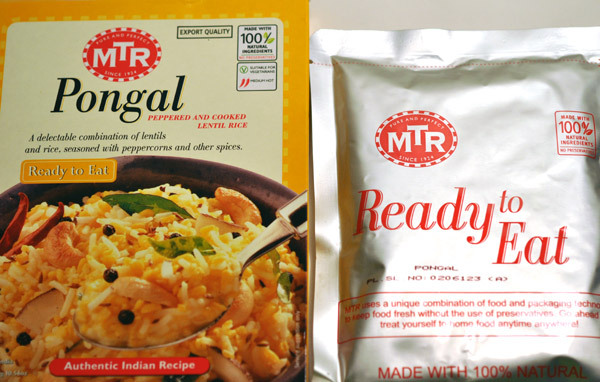 While shopping, my wife found a ready-to-eat Pongal from MTR. Indeed, we had to buy that pongal for the comparison later. Take 1 cup of rice and ¼ cup of mung dal. 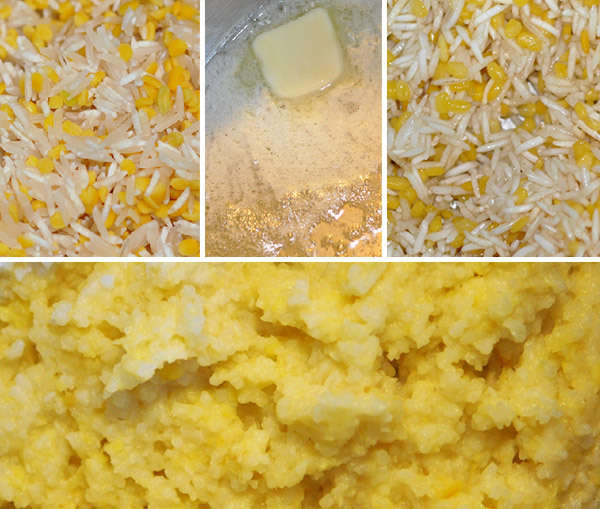 Mix and wash.
Heat 2 tablespoons of butter in utensils, lightly pan fry rice and moong dal until it becomes light brown. Add 5 cups of water and let the rice and dal cook in medium heat until you get thick porridge like consistency. After rice gets right consistency, we can make necessary steps to add spices for pongal. The right consistency is somewhat difficult to define. Rice and transfers into one uniform porridge without trace of their individual grains. It has to be thick enough to hold its shape but creamy enough to melt in your mouth. 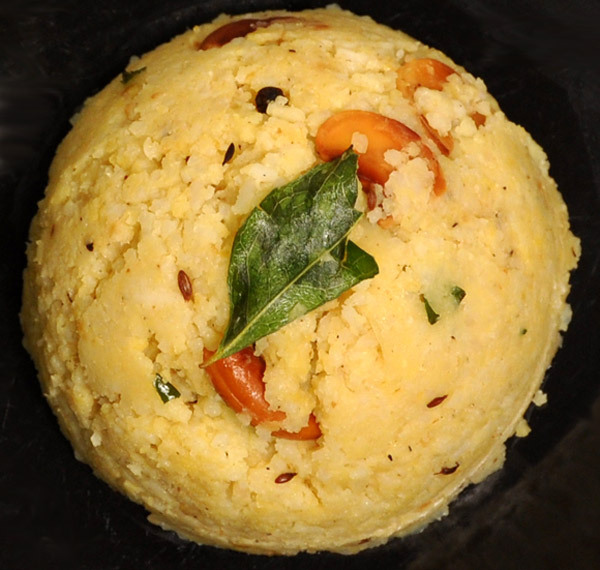 The beauty of Pongal lies in its perfect texture. Heat a frying pan at a medium heat with 1½ of vegetable oil. 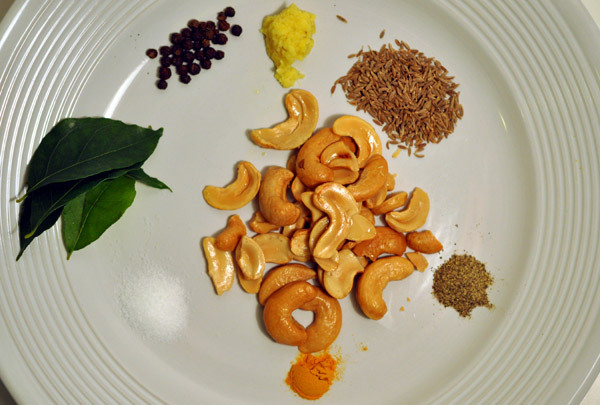 When oil is hot, add following spices; cumin, peppercorn, powdered pepper, cashew nuts, turmeric, ginger, curry leaves, salt in this order. Turn off heat and add rice and mung pongal base and mix. 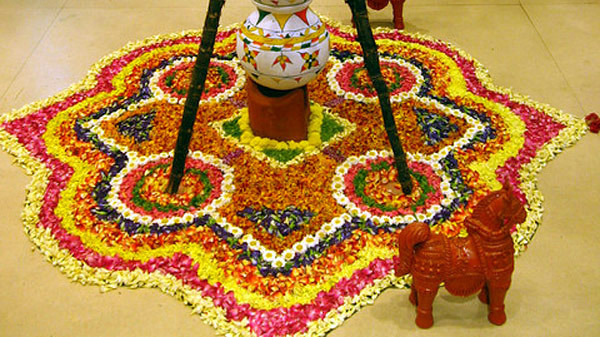 Sculpt pongal into semisphere (half of sphere) shape by putting it in a bowl and transferring it on a plate. 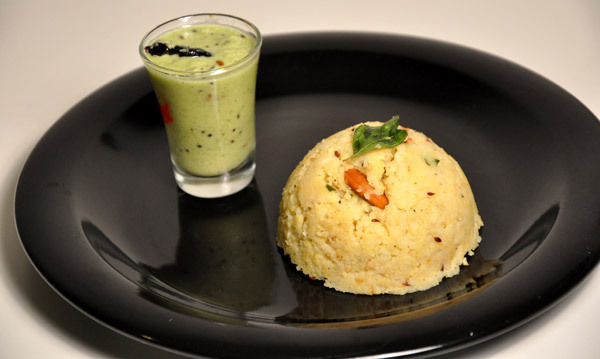 Ven pongal is usually served with sweet and spicy coconut chutney. 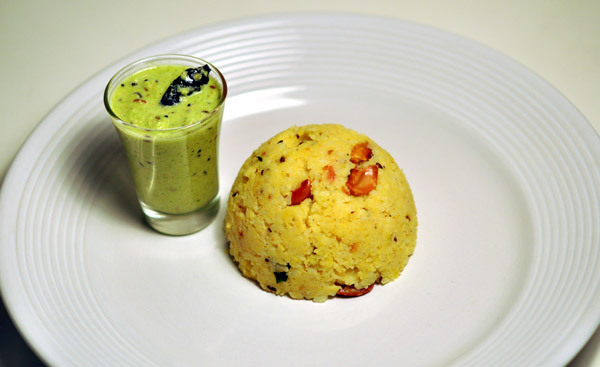 Lightly spiced creamy warm ven pongal is balanced perfectly by cooling spicy coconut chutney. 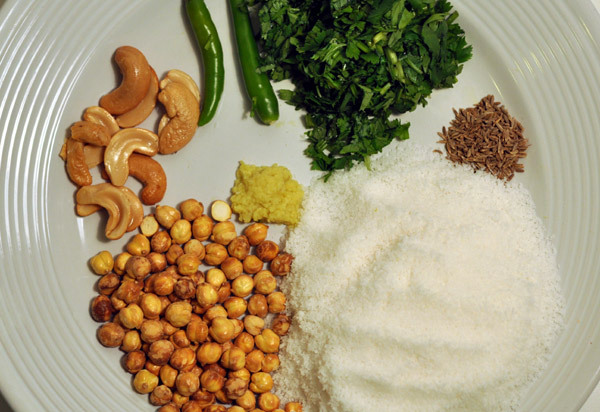 Lightly grind all ingredients listed under the coconut chutney base in a blender. Heat oil. 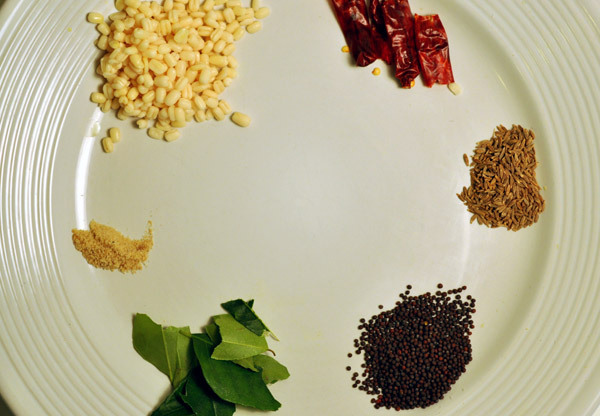 Successively fry following ingredients in this order with few seconds of interval; mustard seeds, cumin seeds, red dry chilies, soaked urad dal (without water), hing, curry leaves. Carefully (without splattering) add the fried spices on top of blended coconut chutney base. Let it sit for few minutes and mix. 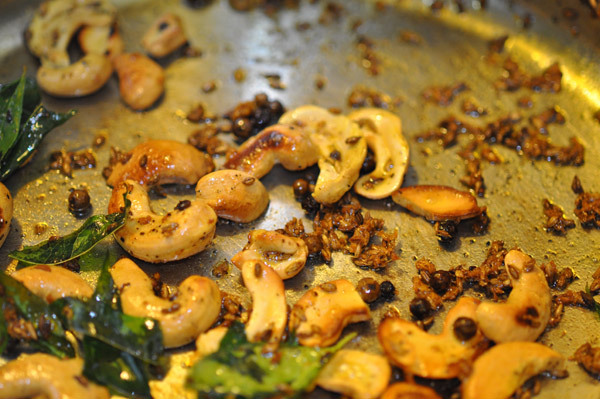 This spice tempering method is called Tadka. Ready-to-eat pongal made by MTR was very easy to make. You can microwave or just immerse in hot water bath. MTR’s pongal was slightly more watery. The flavor was off. Since it might had more turmeric, it tasted a bit like another Indian dish called Khichadi or similar Nepali version called Jaula. Everyone at the table found my first time Pongal far better than the packaged version. Even after sampling a ready-to-eat Pongal, I was still wanted eat authentic pongal in an restaurant. I knew my Pongal was decent but I wanted others, who never had Pongal in their life, to try a professionally made or homemade Pongal for a comparison. Not to my surprise, many Indian restaurants don’t serve Pongal. 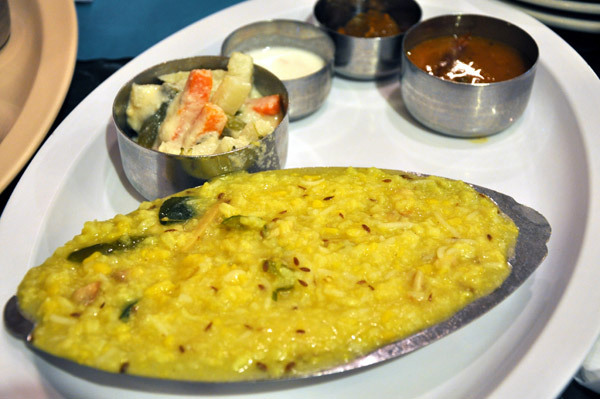 Even among vegetarian restaurants, a few of them served Pongal. In Tamilnadu India, I had the good fortune of eating in chain of restaurants called Saravana Palace. When I saw a restaurant with same name in the greater Washington DC area, I had to go there and try their Pongal. 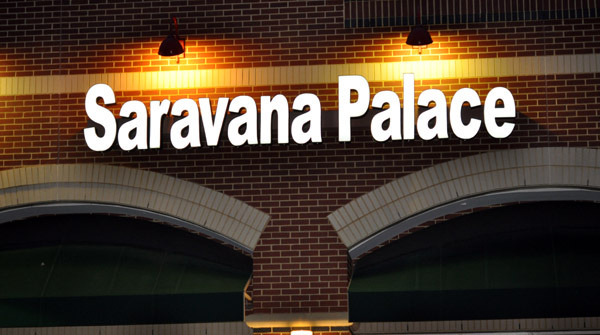 Service at Sarvana Palace in Virginia was friendly, but the Pongal was disappointing. I am sad to say that more than an hour of driving was fruitless. Pongal at the restaurant was worse than the Pongal packaged by MTR. Pongal was very watery and flavor was blander. Avial, a vegetable curry made with coconut from Kerala, was barely acceptable. Three of us barely finished a serving of Pongal. If I had told a newbie to try Pongal at Saravana Palace, I would not be surprised they come out hating it. After trying ready-go Pongal and Pongal at Saravana Palace, I am proud to say that my home made Pongal was able to freshen warm memories of my college days.